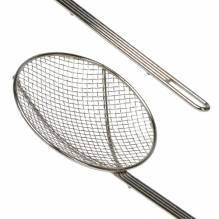 Use a stainless steel mesh skimmer to remove a variety of products from hot oils and liquids! 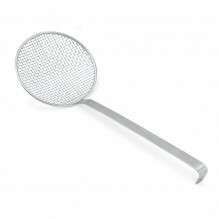 The convenient long handle makes a skimmer a much better tool rather than a perforated or slotted spoon, especially when cooking with oil! With skimmer diameters ranging from 5” to 12”, use to the proper size to ensure the safety of yourself and your employees! 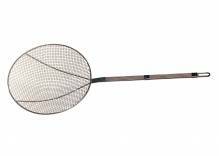 Though round wire and mesh skimmers are generally used, Zanduco also carries a square mesh skimmer, which are used to accurately skim the oil, so it lasts longer!